The capital of kisses, silver barons, mummies, legends and colours. 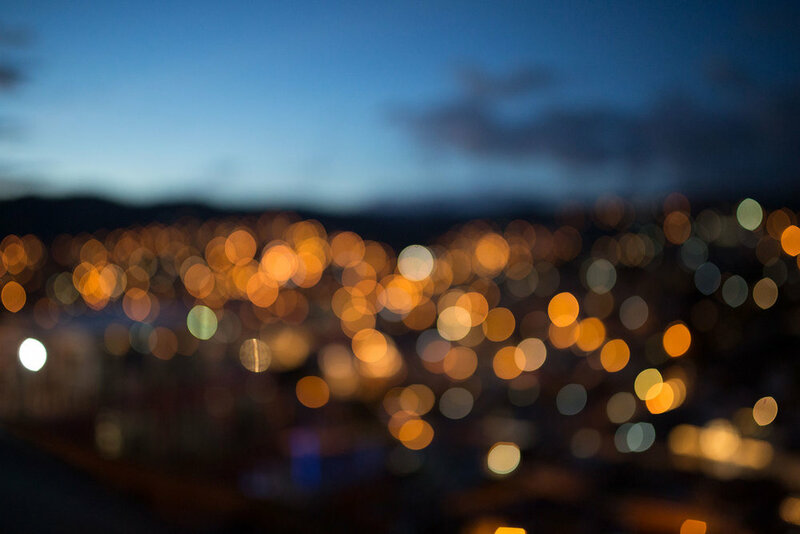 Here you can let your senses loose and fall in love with the city. Even its dark side is full of magic. Photo by my son, Rhodri Martin Jones. To enjoy the city, you have to walk it. The city is compact, full of grand Spanish churches, cute plazas, and lively atmosphere. If you don't walk, you miss all the fun. Saffron yellow? Baby blue? Lime green? Just name the colour and you will certainly find it in this UNESCO World Heritage Site. Strangely, hardly any foreigners around, as they prefer San Miguel de Allende just an hour and a half away (well, the bars there do cater for the American expats, that is true). We only spent a couple of days here in December 2014 and we found ourselves in real Mexico! El Pepila on the hill at the background. 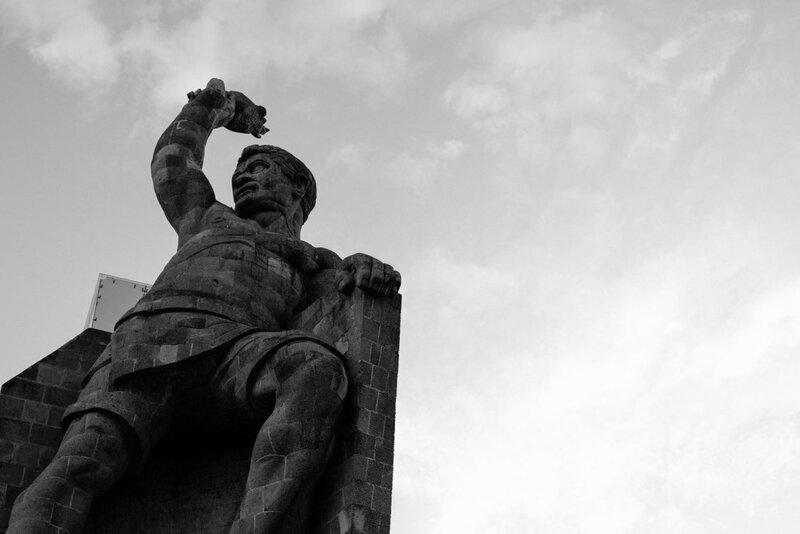 Towering triumphantly over the city, and visible from many alleys, is the statue of El Pipila, the crippled miner who became a hero of the Mexican War of Independence. His real name was Juan Amaro, but because of his deformities from birth, resulting in a twisted walk, everyone called him El Pipila (the Turkey). How did this poor miner become a national hero? It was late September, 1810. 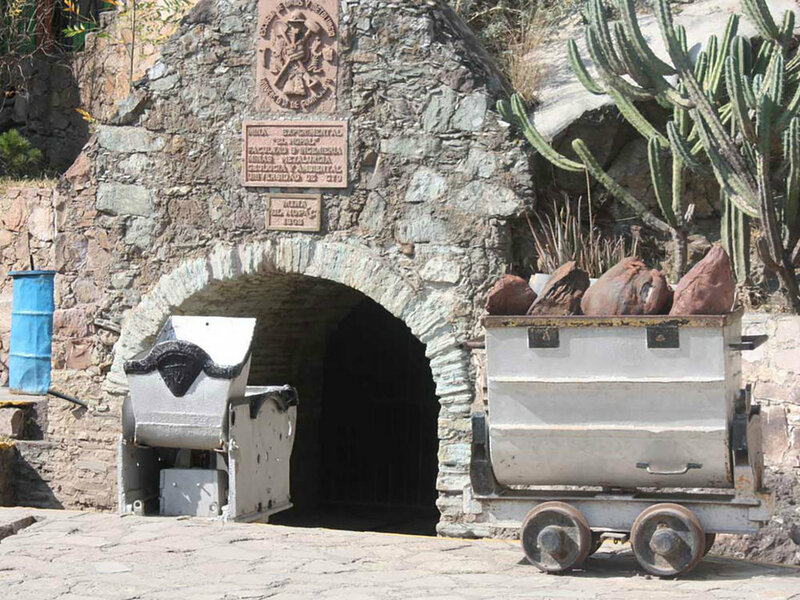 Guanajuato's mines were producing almost two-thirds of the world's silver. But trouble was afoot in nearby San Miguel de Allende. Miguel Hidalgo, a criollo priest, was marching on Guanajuato at the head of his army of the dispossessed: Indians, Creoles and miners. And scuttling among them (as I imagine), El Pipila. The governor of Guanajuato, Don Antonio Riaño, took precautions. He moved the wealth of the province into the imposing public granary, El Alhóndiga de Granaditas (still imposing today, although I'm sorry I don't have my own pictures) along with himself and 500 soldiers. They were prepared for a long siege if the worst came to the worst. The inhabitants of Guanajuato barricaded themselves inside their houses. Hidalgo's army, which had swept through the intervening villages, now came to a halt in front of the grim walls of the granary. I imagine their doubt and uncertainty, although they all knew what treasure lay within. Then El Pipila, with a flagstone tied to his back to protect him from Spanish bullets, scuttled out of the crowd, across the empty square, and managed to set light to the door of the granary. The door was weakened; the smoke blinded the Spanish garrison, and the mob roared in to loot the treasure. A triumph? No. An appalling massacre in which every Spaniard, including the governor, was slaughtered. Within a year, Hidalgo and the other three leaders of the revolt had been executed. Their severed heads hung from the corners of the granary for ten years. (They are now interred under the statue of the Angel of Independence in Mexico City.) But El Pipila lit a flame that could never be extinguished. 'New Spain' did not become independent Mexico until 1821, ten bloody years later. But without the courage of this extraordinary man, it would have been longer, and bloodier. The Plaza of Peace: en.travelbymexico.com. Back in the present. We took a city tour first and then just walked the streets. The tour was in Spanish as none was on offer in English. By the winter of 2014 we understood basic Spanish so we felt comfortable. It is worth taking the tour even if you don't understand, as the bus takes you up to the highlands that surround the city and you can enjoy the beautiful views. The tour also took us to the silver mines above the city. No language needed here. The horrific conditions that the miners worked under to extract vast quantities of silver speak for themselves. It all began, so the story goes, in the mid-1500s when a local Chichimec man gave a piece of silver to a Spanish conquistador. The rest is history. The colonial buildings now stand as a mute witness to the legacy of indigenous slave labourers and the wealth that was created on their backs. 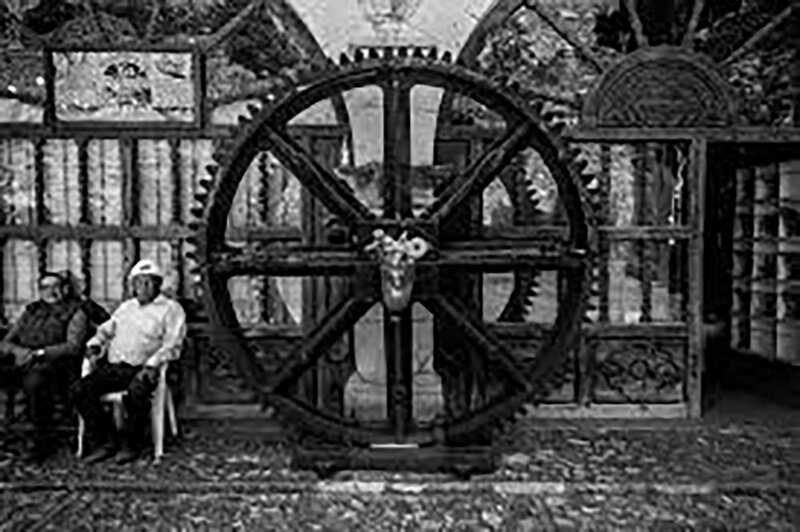 Old Miners and a Wheel, by Gustavo Thomas: flickr.com. 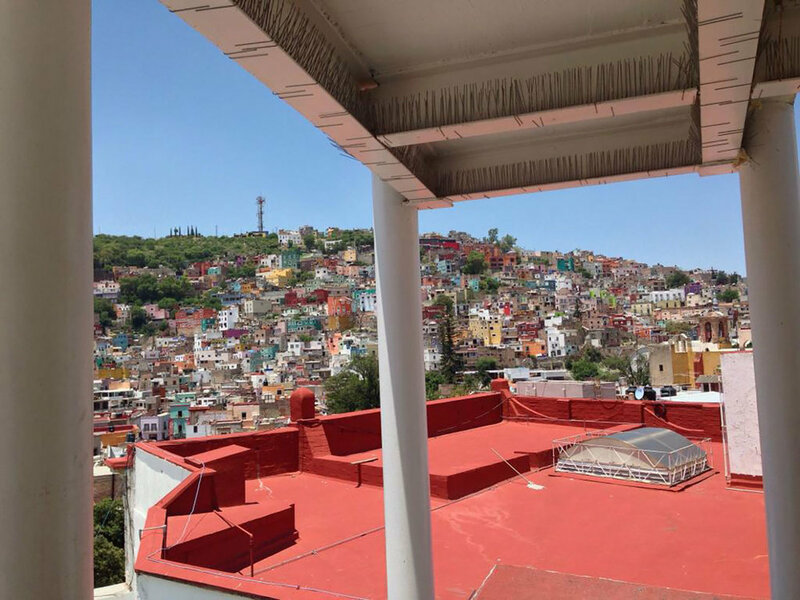 One of the first things you’ll notice when you arrive in Guanajuato, is that the majority of the city’s motorists dive into a network of underground tunnels to get around the city. As a result, traffic is light throughout many of the streets and alleyways of the historic centre. The underground tunnels were another highlight of our tour. Built to prevent the flooding of the Guanajuato River, which once flowed under the city, the tunnels became obsolete after a nearby dam was constructed to control the river upstream. It is fun to just wander a tunnel (each has pedestrian access) and go up a random staircase and see where you end up! 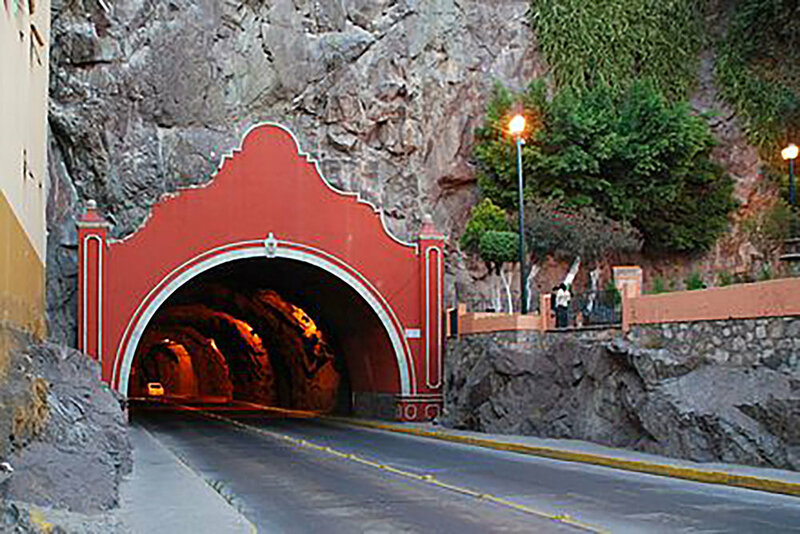 According to local legend, La Llorona (the weeping woman) is said to wander the tunnels of Guanajuato. We have not met her, but watch out for her when you go. She's down there somewhere! Although they are not silver mines, the tunnels are another reminder that the wealth of this city was based on digging very deep holes in the ground. Silver does not lie on the surface for the casual passer-by. Even with modern methods, you need to blast, dig, carry and process a tonne of rock to yield 200g of silver. The FA Cup, for example, at 6.3kg, would need over 30 tonnes of rock to go through this process. Imagine what that means in terms of indigenous slave labour! Tunnels of the city: en.wikipedia.org. 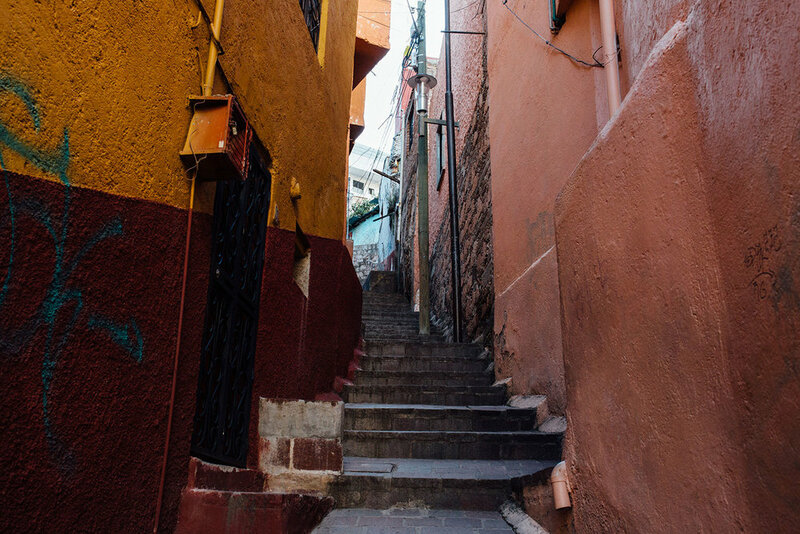 Above ground, Guanajuato's charm is in the endless number of small streets and alleys but the El Callejón del Beso is by far the narrowest. 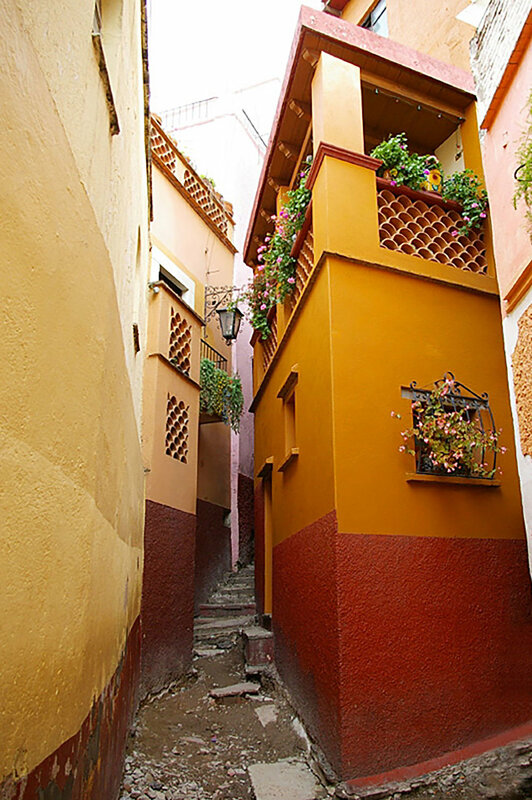 The Alley of the Kisses has a superstition associated with the tragic story of two unfortunate young lovers. Doña Carmen fell in love with Luis, a poor miner, against her father's will. The story goes that Luis managed to buy the house opposite Doña Carmen's with his life savings. Doña Carmen appeared on her balcony and found her lover within touching distance, but her infuriated father stormed into her room and stabbed her through the heart. Luis kissed her dead hand. He could not live without her, and threw himself into the 600m shaft of the Valenciana mine. The whole history of Guanajuato revolves around holes in the ground. A romantic tale (and shorter than Romeo and Juliet) but we did not find the alley very romantic as it was absolutely packed with people and we all had to wait our turn to go on the crucial third step and kiss. However, we were the oldest couple who came here so we had huge ovations from the crowd. To take a picture of ourselves was impossible so I don't have any evidence to prove our kiss. But I am consoled by the fact that our love will last forever (well, 30 years by now, not too bad). That is what they say here. Go on that third step in the alley and kiss to seal your love forever. 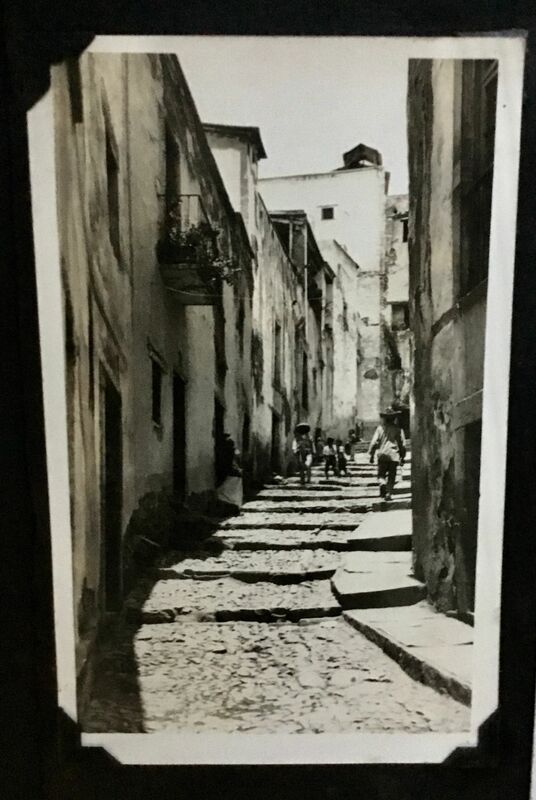 An old alley in Guanajuato: i.pinimg.com. After the 'kiss', we went to the Museum of Diego Rivera (who was born here) and then strolled through the nearby alleys. Lovely cafés and bars everywhere. Another option was the Museum of Mummies (if you enjoy the healthy Mexican relationship with death). We now have the Museum of the Underworld in Playa del Carmen and can admire the replicas of Guanajuato mummies there. The view of the city from Diego’s rooftop. Guanajuato mummies: replicas at Playa del Carmen’s Museum of the Underworld (Muxi). At night we just showed up in the evening at the Jardín de la Unión, the city's central square. It is a beautiful square with a small triangular garden and a meeting place for guanajuatenses. You can choose a restaurant here or just sit under a tree in the park. At weekends live music plays from the kiosk in the park but the competition for music options is high. There were several groups of estudiantinas equipped with guitars, mandolins and tambourines, offering their demo outside in the park and in the square . Back in the 60s, a group of enthusiastic young people discovered the music of the Spanish student minstrels, called 'estudiantinas', and they got together to sing their music. The University of Guanajuato supported this movement and formed the first group of pied pipers. The city has quite a few minstrel groups now. It makes a great night out! After a short demo, we chose a group, bought our tickets and then just followed them, away from the centre, beyond the church of San Diego. We were given little ceramic carafes of wine and listened to jolly music and jokes and sipped the wine while we walked. We stopped in a few small plazas and, believe it or not, during our night walk, there were three marriage proposals within our group of 30. All three accepted. I mean, I can't blame them. It was a very romantic walk and the right moment to get emotional, during the music of minstrels. Or perhaps it was planned and chosen as the best moment to do so. I just hope they went to the Alley of the Kisses the following morning!!! 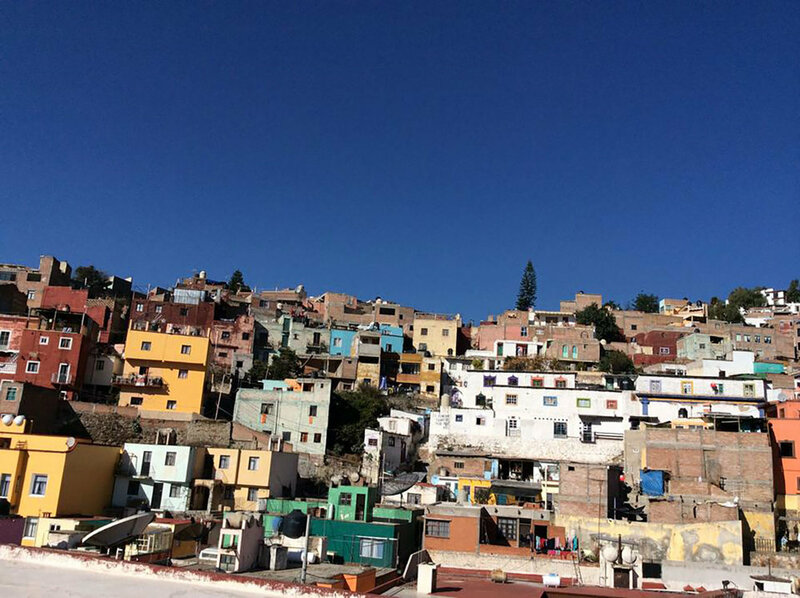 What to make of Guanajuato? You could leave here with the happiest memories of colour, friendly atmosphere, food and music. One of our favourite spots was Plaza de San Fernando, packed with bars and restaurants amid the colonial houses and friendly people (photos below). Never during our travels have I fallen in love so quickly with a city. Guanajuato is beautiful. It's intimate. But it is built on blood and extraordinary heroism. It's worth digging deep. Do walk about and feel its heart! You can hop on a luxury bus from Mexico City— the trip takes around 4 hours. Guanajuato is located in the foothills of the “Sierra Madre Oriental” mountains, 370km north-west of Mexico City. All buses to Guanajuato depart from the “Autobuses del Norte” (North Bus Station) in Mexico City. A musician on the bus, on the way to Guanajuato (left photo). That itself reveals that you are going to have a great time in Guanajuato. 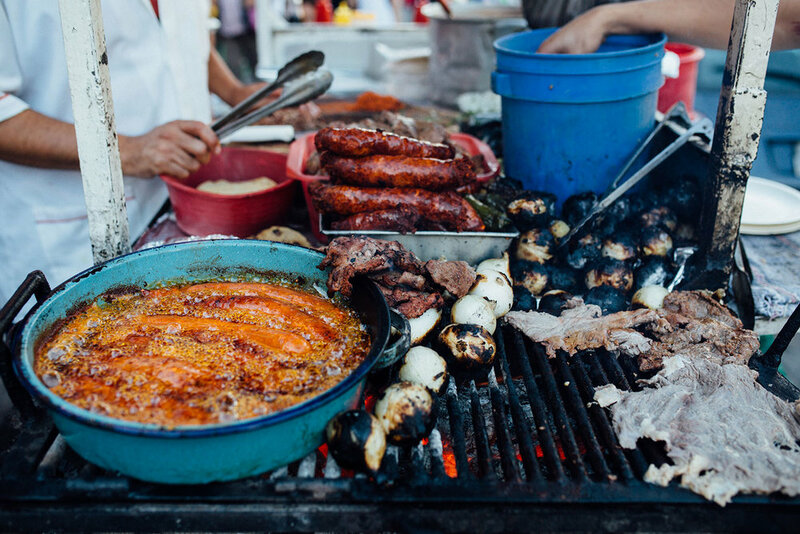 It is also worth popping to the nearby town of San Miguel de Allende. It was voted by travellers as one of the best cities but expect a lot of Americans here (they come here for the art scene). I prefer Guanajuato with its authentic ambience. Alternatively, visit Querétaro, the city of the Otomí people.